In Hollywood, awards season takes place during January and February but here at SenecaMedia, April is all about recognizing the Oscar-worthy work our students do. Speaking of Oscars, the calibre of short films showcased from this year’s 4th semester students of the Television Broadcasting program were not your average student films. 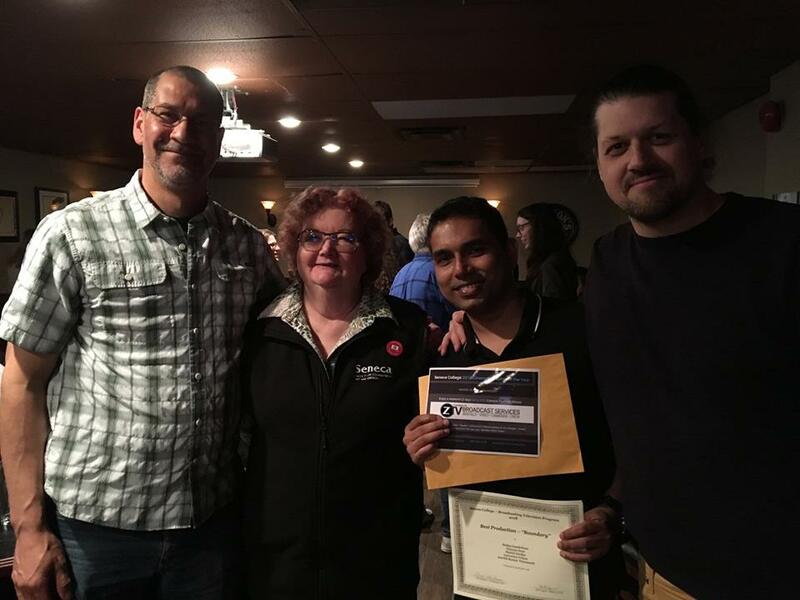 On Tuesday, April 17th at the Sandra Faire and Ivan Fecan Theatre, faculty, friends, family, and alumni gathered for the premiere of the short films the students spent their two years at Seneca working towards completing. 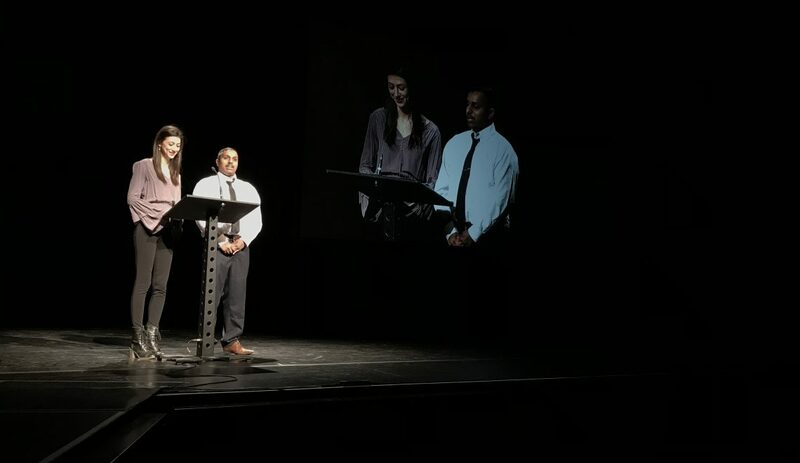 The screening was hosted by RTVT students Peralahan Rasalingam and Lana Cvijetic, whose entertaining banter introduced each film’s synopsis and production crew. The films covered everything from haunted musical equipment to futuristic medical procedures to third-wheeling roommates. Students form production teams to run and organize their films all on their own. Every job from producing and directing, to audio and editing is done by the students. They also collaborate with Seneca’s Acting for Camera and Voice program to get their starring actors. Students coordinate their equipment rentals with the A/V department and handle all the logistics surrounding booking the various locations they require for their scripts. Suffice to say, by the time they’re done they definitely have a good idea of what it’s like to produce a film. After the films premiere, the real work for the faculty begins as they deliberate on which productions should receive the annual RTVT Short Film Awards. The categories cover everything from special effects and screenplays, to cinematography and editing. The diverse set of skills that each production crew contains is what helps set the films apart in certain areas and showcase a specific skill more than others. Some crews may have team members who love diving into After Effects and really pulling out all the stops in post-production special effects. Others, have audio engineering experts who have those well-trained ears that pick up every sound wave on set and know how to bring the audio experience to its fullest potential in the mix down process. Although the nomination and voting process are kept highly confidential by the faculty, it’s safe to say they don’t take this task lightly and thoroughly enjoy celebrating the students’ hard work. Interested in watching some of these award-winning films? Check them out!